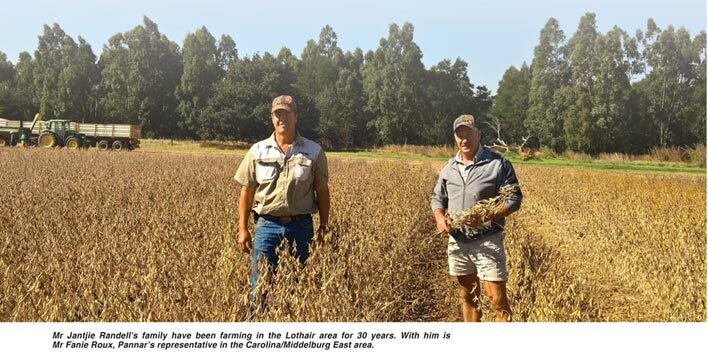 For nearly 30 years Mr Jantjie Randell has been farming in the Lothair area – where they did not even know about Sclerotinia in the early years. These days they sing a different tune. Jantjie, his father Jan and brother Philip run an extended mixed farm in the Lothair area in Mpumalanga. They use crop rotation with maize and soybeans and also farm with wool merinos and Sussex cattle. They also have eucalyptus trees that they cut for the paper pulp market. Although years ago Sclerotinia was initially barely visible, it became such a problem at a certain stage that in certain years it damaged up to 75% of the plantings. Mr Fanie Roux, the Pannar Seed representative in the area, says that Jantjie had planted the PAN 1623R this year for the second time. The yields varied from 2,6 t/ha - 3 t/ha and in some cases even yielded higher. ‘The agronomical characteristics of this cultivar perfectly suit Jantjie’s cultivation method and the wide rows that he plants. This strong, robust plant with its indeterminate growth habit, strong root system and good resistance to lodging does not have an equal in Jantjie’s area,’ says Fanie. Due to the fact that Lothair’s weather is ideal for Sclerotinia, with temperatures regularly between 15°C and 21°C during summer, control of the fungus is very difficult. Jantjie has been planting soybean trials for Pannar for many years and one year realised that the cultivar with the missed row – five rows instead of six – won the trial without any adjustments being made. ‘This rang a bell. I obtained more information from Pannar on plant establishment in soybeans. I learned that certain cultivars only showed a drop in yield from a plant population as low as 180 000 plants/ha,’ explains Jantjie. Reducing the plant population was not an easy decision for him, because so many experts recommend that soybeans should be planted in narrower rows and with a higher plant population. ‘That is why I started with trials where I tested the plant population and even experimented with two missed rows with a six-row planter,’ says Jantjie. After several trials Jantjie concluded that a greater yield can be obtained when there is maximum sun exposure between the rows. Keeping this in mind, he decided in 2014 to adapt his planters. ‘2015 was very dry in February to March and no Sclerotinia was observed, because of the drought I only harvested an average of 1,7 tons. The wetter conditions earlier this year were ideal for Sclerotinia. We harvested an average of 2,5 tons on 1 690 ha with the wider rows,’ says Jantjie. The 10% - 15% yield loss they experience by planting wider rows is not a problem to Jantjie, because they then prevent the 30% - 50% loss that the Sclerotinia could have cost them. Their plant establishment is approximately 220 000 to 240 000 plants/ha, which corresponds to 33 to 36 seeds/metre. Article written by Marieke Snyman, Pannar Seed. For more information, contact Reggie Mchunu, Pannar Agronomist, reggie.mchunu@pannar.co.za.